After a recent interview where the topic was all things related to children’s education and literature, my interviewer casually mentioned the following article in that Sunday’s Parade magazine. As it featured a children’s author dear to my heart, and one we’ve posted about before, I thought you all might be interested to read this delightful article which gives background information on the beloved children’s classic Misty of Chincoteague. This story is based upon the real lives of Paul and Maureen Beebe and their childhood desire to own and raise a Chincoteague pony. A herd of feral ponies that reside on Assateague Island in Maryland are supposedly the offspring of Spanish ponies whose owner’s galleons were shipwrecked during the period of Spanish exploration and conquest of the Americas. Each year the town of Chincoteague holds a Pony Penning Roundup where the yearling colts are rounded up and swum across the channel to be auctioned off. If you’re not familiar with these stories, I’m sure you can just imagine all the rich literary fodder here for a marvelous children’s tale. And Marguerite Henry delivers on every score. Not only are each of her horse stories based upon true incidents in history, but she manages to make each tale adventurous, exciting, and character building all at the same time. And once you’ve read the book, there’s an old movie based upon the book titled Misty. While movies are rarely as good as the book, this one has pleasant on site footage of an actual pony penning, and endearing and realistic casting. Enjoy it with your kids! Thank you for sharing this. I read all the horse books I could find when I was a child – I was a city girl who wanted to be a country girl with lots of horses. I still have my VERY worn copy of “Misty of Chincoteague”. 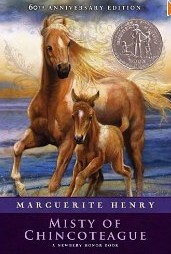 However, in all that reading, somehow I never learned that Marguerite Henry’s stories were based on real events and horses. So this morning I just learned that the wonderful stories about the dear horses I have loved since childhood are REAL – not just make-believe. The were living in my imagination, but now I know they really lived! Thank you! What an amazing book and an eloquent author! I was just going through my classroom library and came across a copy. Why is it that horse stories speak to young girls?